«MISS CORABIA» BACK-ON TRACK !! With late arrival at the semi-final (192 prize at 515km), our 26-prize FCI Final winner «MISS CORABIA» ensure participation from our loft also in the Corbaia OLR final (525km). With a little skeptical, we look forward to the Corabia OLR final were 4 of the 217 basketed finals birds are from Norway. 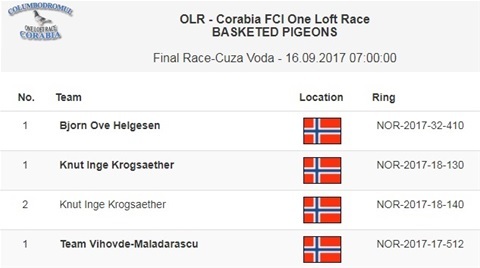 This bird is ranked 7 ACE SPEED bird (towards 1.831 starting birds) and is a full sister «BIG COSMO» raced 67 prize in Sofia OLR Final 2017 (420km).